Modell announced on November 6, 1995, that he had signed a deal to relocate the Browns to Baltimore in 1996 a move which would return the NFL to Baltimore for the first time since the Colts relocated to Indianapolis after the 1983 season. 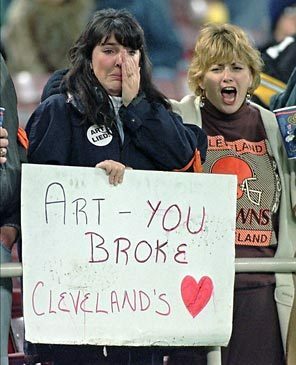 The very next day, on November 7, 1995, Cleveland voters overwhelmingly approved an issue that had been placed on the ballot at Modell’s request, before he made his decision to move the franchise, which provided $175 million in tax dollars to refurbish the outmoded and declining Cleveland Municipal Stadium. Modell’s plan was later scrapped and taxpayers ultimately paid close to $300 million to demolish the old stadium and construct a new stadium for the Browns on the site of Municipal Stadium.